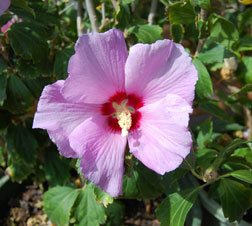 Althea-Rose of Sharon is a hardy deciduous member of the tropical hibiscus family. Its late bloom, striking flower-shape, ease of maintenance, and good drought tolerance (once established) makes this perfect for northern New Mexico gardens. As one of the few summer-blooming shrubs, Althea-Rose of Sharon bear 4-inch, lobed or toothed leaves that emerge so late in the spring that sometimes gardeners who are new to this shrub worry that their plants have died. Just be patient—the reward will come. Flowers appear from mid- to late summer and bloom until early fall. Individual blossoms open in early morning and close at night, lasting about three days each. Each flower bears an intensely maroon central spot, a target zone where nectar pools, attracting hummingbirds and bees. Plant bushes in spring or fall, spacing them 6 to 10 feet apart. While these shrubs are drought resistant once are established, for the first few seasons water deeply several times a week to allow the roots to establish themselves thoroughly. Apply a layer of compost under the shrub each spring and add a 2-inch layer of mulch to retain moisture and control weeds. If rainfall is less than 1 inch per week, be sure to water these shrubs. Flowers are produced on new wood, so prune in early spring to shape and reduce size. Pruning the shrub back to 2 to 3 buds per branch in spring encourages larger flowers. Remove dead, diseased, and injured branches any time. Although naturally multi-stemmed, Althea-Rose of Sharon can be trained through pruning (in late winter) to a single main trunk.